Location: The southern-most city in Southeastern Alaska. Population: 14,000. 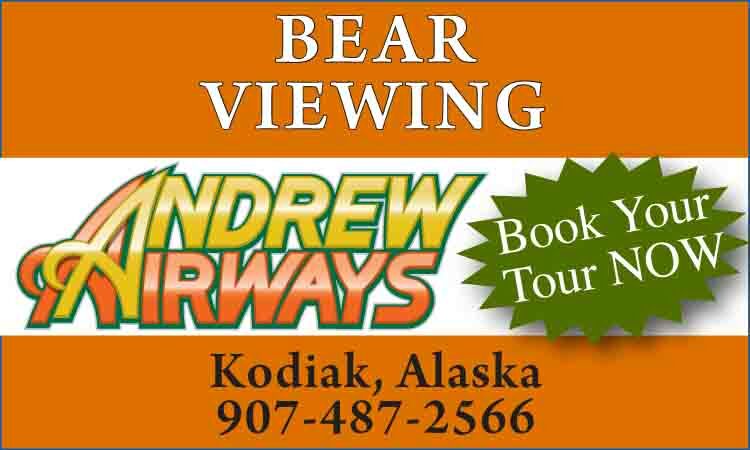 Visitor Information: Ketchikan Visitors Bureau, 131 Front Street, Ketchikan, Alaska 99901; Phone: (907) 225-6166; Toll Free: (800) 770-3300; Southeast Alaska Visitor Center (and Alaska Public Lands Information Center), 50 Main Street; Phone: (907) 228-6214; Email: info@visit-ketchikan.com. The frontier flavor of Ketchikan, complemented by its scenic beauty and mild climate, world class sport fishing and cultural heritage have made it one of the most popular visitor destinations along the Inside Passage. An island community and transportation hub for the southern portion of southeast Alaska, Ketchikan can be easily accessed by air or water. 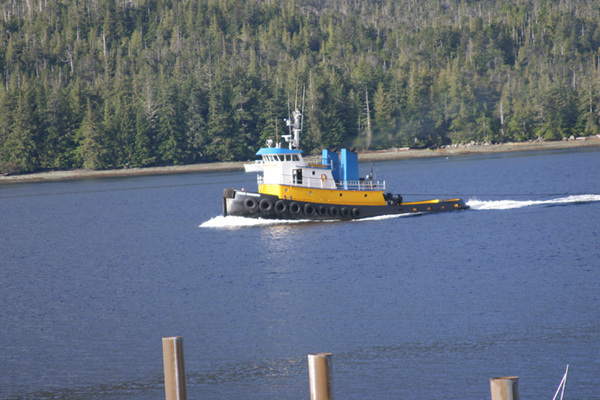 Ferry service from Bellingham, Washington and Prince Rupert, British Columbia via the Alaska Marine Highway accommodates motorists and foot passengers. Daily jet service in and out of state and local bush planes (most on floats) operating between Ketchikan and outlying communities provide air transportation for visitors. Fishing is serious business in Ketchikan. Home to the largest charter fleet in the state, the area is known as Alaska’s sport fishing capital. Anglers can test their skills against several species of salmon, as well as halibut, cod and bottom fish, or try their luck fishing for Dungeness crab and spotted prawns. Freshwater fishing is also popular: Dolly Varden, rainbow, cutthroat, brook and steelhead trout are all within easy access. Some charters offer a two-for-one experience, which provide a narrated city tour by motor coach as well as a fishing experience. Ketchikan’s King Salmon Derby is held in May. The Metlakatla Indian Reservation on nearby Annette Island is home to descendants of Tsimshian natives who immigrated to the Island by canoe in the late 1800s from British Columbia. Poised on the shores of the Tongass Narrows at the site of a fish camp established by the Tlingit, Ketchikan is home to a greater concentration of Native Alaskans than anywhere else in the state. The world’s largest collection of totem poles can be viewed at four major locations. In 1938 the US Forest Service began salvaging overgrown and weather-damaged cedar totem poles that were left behind when southeast Alaska Native peoples abandoned villages in the early 1900s, in response to the growth of non-Native settlements and the decline of a barter economy. When skilled carvers were hired from among the older Natives, young artisans learned the art of carving totem poles, and totems found rotting in the woods were repaired or duplicated. The model clan house at Totem Bight State Historical Park and new totem poles were constructed in traditional fashion using pre-European contact tools. 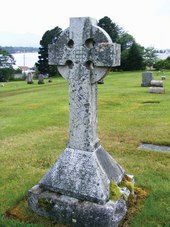 Samples of paint were created from clam shells, lichen, graphite, copper pebbles and salmon eggs, then the colors were duplicated with modern paints. 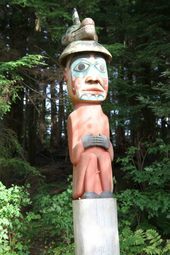 The Totem Bight site, located 9.5 miles north of Ketchikan, was added to the National Register of Historic Places in 1970. 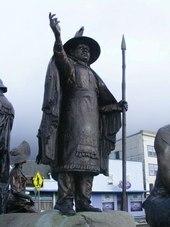 In nearby Saxman Native Village, located about two miles south of Ketchikan and home to about two dozen totem poles, Cape Fox Tours offers visitors the opportunity to watch traditional master carvers such as National Heritage Fellowship recipient Nathan Jackson at work, and view performances by Tlingit dancers dressed in full regalia. Visitors to Cape Fox Lodge on Venetia Way are greeted by a large circle of six beautifully carved modern totem poles. The “Council of the Clans” Totem Circle poles were carved, painted and inlaid by Eagle Clan member Lee Wallace, a Tlingit, Haida and Tsimshian Native Alaskan. Subject matter includes Raven Stealing the Moon and Stars, Raven Stealing the Sun, Eagle Dancer, Giant Clam, Brown Bear and the ceremonial mediator figure Naa Kaani. Located on Deermount Street near City Park, the Totem Heritage Center also conserves some of the totem poles rescued from old villages. Wildlife sightings are an every day experience around Ketchikan. Black bear are common throughout the region, along with brown bears in mainland areas. Bald eagles are everywhere. These majestic birds are easy to spot, perched in shoreline trees, near salmon spawning streams and around their many nesting areas. Sitka black-tailed deer and mountain goats are plentiful, wolves may be sighted and moose range the mainland. Sightings of orca and humpback whales, seas lions, seals, sea otters and porpoise may be enjoyed on excursion cruises and ferries. A large variety of sea birds are always present. Marten, mink, river otter, beaver, herons and ravens can be seen along beaches and streams, including downtown Ketchikan Creek. Situated within the 17 million acre Tongass National Forest, Ketchikan provides outstanding recreational opportunities. There are several camping facilities in the area. The Forest Service operates Ward Lake Recreational Area, located 8 miles north of town. Signal Creek, Last Chance and Three C’s Campgrounds provide a total of about 50 sites. Operated by the Alaska State Park system, Settler’s Cove Campground provides 14 campsites situated on salt water. Private RV facilities are also available on a limited basis but fill up quickly during peak summer months. 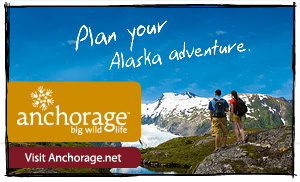 Contact the Ketchikan Visitors Bureau for more information. Misty Fjords National Monument is a pristine masterpiece of nature sculpted by glacial action over the centuries. Soaring cliffs, lush hanging valleys and bottomless saltwater fjords are some of the features of this remote treasure. Ketchikan provides daily access to lesser-known but equally outstanding visitor destinations. Prince of Wales Island is a great place for RV travelers to explore and is home to an extensive karst (eroded limestone) network, carved over 4 million years into a series of caves and subterranean streams. Early Ketchikan’s waterfront was the economic and social center of the community. Almost everything arrived and departed by way of the docks. Streets, stairways and boardwalks began at the harbor and navigated up the hillside and along the shoreline into Newtown. As the dream of gold brought settlers and adventurers to Southeast Alaska in the early 1900s, Creek Street’s boardwalk began 50 years of notoriety as the most infamous red-light district in the Territory, with 30 brothels and 50 ‘sporting women’. During prohibition and later, the historic area became Ketchikan’s #1 attraction with Colorful Characters interpretive signs. 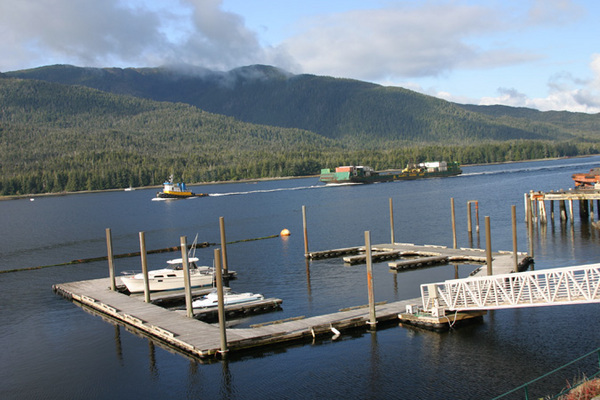 Stretching 1.3 miles along the Tongass Narrows, from Berth Four on the north to the end of the Thomas Basin breakwater on the south, Ketchikan’s Boardwalk connects historic neighborhoods, cruise ship berths and maritime harbors. As if to provide a ‘front porch’ to the City’s four historic districts and preserve their stories, the Boardwalk offers local artwork, benches to rest and socialize, easy connections to retail stores, attractions and museums, and safe comfortable recreation for people of all ages and mobility. Ketchikan provides a variety of accommodations ranging from the youth hostel to bed and breakfasts, hotels and motels, many featuring restaurants and lounges on premises. fishing lodges and world-class resorts. 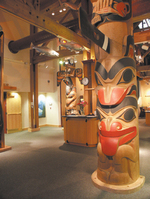 Experience world-class exhibits and award-winning audiovisual programs at Southeast Alaska Discovery Center, where you can view Tsimshian, Haida and Tlingit totem poles, stroll through the rainforest room, discover a Native fish camp scene, learn about Southeast Alaska’s ecosystems and listen to people who work in the timber, fishing, mining and tourism industries. 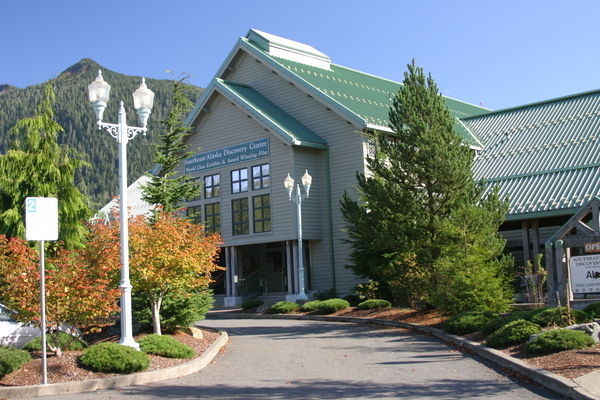 The Center houses seven exhibit rooms and a trip planning room, located one block from the cruise ship dock in downtown Ketchikan at 50 Main Street. Open daily from 8:30 AM to 4:30 PM May to September. Tongass Historical Museum offers changing exhibits of local history and culture. “The First People” is a permanent exhibit on Tlingit, Haida and Tsimshian culture. Over one hundred objects, from pre-contact stone tools to art objects created by contemporary Native artists are displayed in this comprehensive exhibit of Southeast Alaska Native artifacts. Located in the Centennial Building at 629 Dock Street; (907) 225-5900.